I'm a big fan of Belgian Trappist beers, and Trappistes Rochefort 10 is one of my favorites. 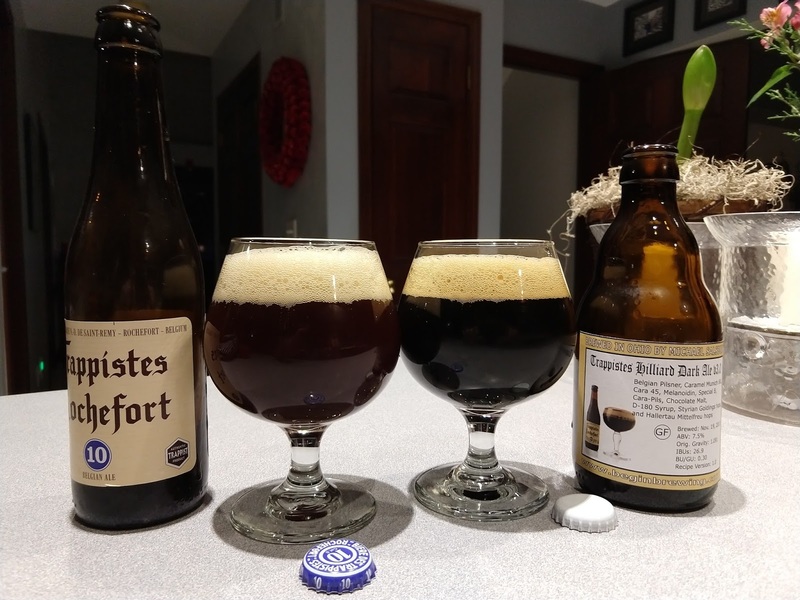 Some time ago I came across a recipe that claimed to be "very much a Trappistes Rochefort 10 clone" and brewed it. The creator of the recipe was correct, it was quite close to the original. 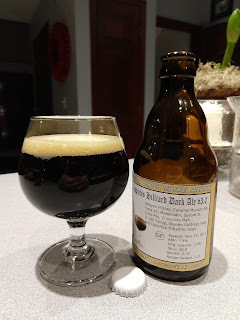 The clone seemed to be missing the head and a caramel note in the original beer, so I tweaked the recipe to include Melanoidin malt and Carapils malt, which in combination seem to me to produce a very creamy, long-lasting Belgian-like head. Unfortunately in the second version I also added a high-alpha hop to help with head generation and that ruined the beer for me. In this version, I'm going back to the original roots. I'm using just Styrian Goldings to bitter it and Hallertau Mittelfrueh for flavor and aroma. I'm adding Belgian Cara 45 malt to try to capture the caramel note that was missing from the first version. I'm also using White Labs WLP540 yeast which is purportedly the Rochefort strain. My actual ended up being approximately 5.5 gallons at 20.2 Brix. However, after recently recalibrating my refractometer against a hydrometer, that actually works out to a gravity of 1.086 SG or 20.7 Brix (the refractometer reads low). That works out to an efficiency of 74.9%. That means the beer should probably come out around 8.4% ABV instead of 9.6% as intended. Placed 6.5 gallons in The Grainfather's kettle and began heating it to 154F. Placed 2 gallons in a separate kettle to serve as sparge water. This yielded approximately 7 gallons of wort at a gravity of 17.2 Brix. This was more wort than I needed (6.6 gallons) so a longer boil was required to get the gravity closer to the intended amount. I would guess from this that the beer will have no problem generating and holding a head later on. Post-boil there was just a hair under 6 gallons in the kettle. Pumped into the fermenter, it hit the six gallon mark, as very little remained in the kettle at the end. Gravity measured 20.2 Brix and 21.2 Brix on different attempts. I wanted to do a hydrometer reading but I had misplaced the sample tube. The plan is to let this one free rise and ferment as the yeast activity dictates. I hooked up a blow-off tube in anticipation of blow-off, since there wasn't a lot of head space in the fermenter and this is a relatively high-gravity brew. I'm planning to give it about 2 weeks in the primary fermenter, then transfer it to another fermenter for 4 more weeks as secondary. Then I'll bottle it, aiming for 3.0 to 3.5 volumes of CO2. 11/20/2017: 36 hours after pitching the yeast, I saw no activity through the blow-off tube. I was concerned, so I popped the lid to find a nice thick krausen. Now, there is significant activity. The tube is burping at least every second. 11/21/2017: The blow-off activity has slowed, but the water in the blow-off jug now has a pale brown color. Tube burping has slowed to maybe once every two seconds. 12/10/2017: Primary fermentation has finished. I decided to skip a secondary fermentation, as I doubted this would benefit the beer... though this was only a guess. In lieu of this, I would plan for a long bottle conditioning phase instead, and accelerate this with relatively high temperature. Based on some reading I had done since brewing the beer, I learned that many of the breweries in Belgium ferment and condition at temperatures as high as 95F. I configured my "hot box" (insulated cooler with temperature control) to keep the beer at 85F. I'll leave the beer in there for a month, or until I need the cooler again. This batch provided another test of the Brewcolator device. Anecdotally, it seems like batches brewed with the device cause the basement to seem more humid than batches done without it. I haven't been diligent about measuring boil-off with and without it, to see if that can be proven scientifically. That's something I need to do. I do think it may be contributing to clearer beers, but again that's not scientifically proven yet either. I do know that it tends to make drops of wort end up all around the kettle, which adds to cleanup a little. Gravity came up low on this one relative to what I expected. In part, I think this is due to my mash and sparge water calculations being off. I'll have to watch those on the next batch. 12/10/2017: At the end of the brew, the fermenter registered six gallons instead of the 5.1 I expected. Today, at bottling, the number registered approximately 5.25 gallons. I knew the markings in this particular fermenter were off, but I didn't realize they were that far off. Since my priming sugar dose was based on that figure, the beer will end up being carbonated to around 3.5 volumes of CO2 instead of the 3.25 I had planned. That's a legitimate level for a Belgian style beer, but concerns me because of the chance of bursting one or more bottles. We'll see how it goes. 12/15/2017: I chilled a bottle of the beer and opened it. It poured a very dark brown, nearly black, with a thick light brown head that lasted quite a while. The aroma was one of chocolate and dark fruit. The flavor had a touch of chocolate, lots of dark fruit, and (unfortunately) a distinct hoppy bitterness that detracted somewhat from the beer. The dark fruit flavor, and the intensity of it, is something I've been trying to achieve in my Belgian-style beers forever and failing at. This recipe gets it right. I can imagine that if the gravity of this was dialed up high enough and the bitterness dialed back enough, it could almost taste like Gulden Draak... one of my favorite brews. 12/22/2017: The beer has been in the "hot box" now for 12 days. The hot box has kept the beer at a near-steady 85F, which has helped to carbonate the beer and (I hope) accelerate the bottle-conditioning process to improve the flavor. Tonight I removed it from the hot box and left it out in the basement at ambient temperatures, which right now are in the upper 50's and lower 60's. The beer has also been labeled. I kept a six-pack of the beer out of the hot box to see if there is any difference in taste between the beer that spent time at 85F and the same beer left at ambient basement temperatures. I'm curious to know if, in the future, I can simulate an extended aging period by keeping the beer at a high temperature for a few weeks. More on this as I learn more. 12/24/2017: Over time, the beer has changed a little. The chocolate note in the aroma has dropped back to the background and the dark fruit is more prominent in the aroma. Overall, the flavors are mingling more and the beer seems to be getting smoother. I think the extended time in the hot space helped accelerate the conditioning process - but I will need to do some taste testing against a beer not placed in the hot box to see. I also need to compare the beer to an actual Trappistes Rochefort and see how it stacks up. As you can see in the above photos, the two beers do have similarities. Appearance: The real Rochefort 10 is slightly reddish, and dark brown, more or less a mahogany. It has a thick beige head that lasts a while, and a lot of carbonation. Mine is almost black, has a slightly darker head, and a head that lasts a little longer than the read Rochefort. Both leave behind lacing in the glass. Aroma: The real Rochefort 10 has a pleasant dark fruit aroma, reminiscent of prunes, plums, or raisins. There is a hint of sweet malt and maybe honey, and a hint of minerals. My beer has more of a malty/chocolatey aroma, practically no dark fruit (at least in comparison), and the same hint of minerals. Both smell good, but they definitely smell different. Mouthfeel: Both are medium to full bodied, effervescent, and with a slight warmth to them. The real Rochefort 10 has more of a warming note. Flavor: The real Rochefort 10 starts malty, followed by a moderate amount of dark fruit flavor. There are hints of roasted grain or burnt sugar, but these are minimal at best. There is a warming element to the beer on the back of the throat. Mine starts malty, then turns chocolatey. It's lightly sweet, delivering more of that burnt/roasted element than the real Rochefort. The finish is chocolatey and malty. Dark fruit does make an appearance, but it's a more brief (but more intense) flavor. The warming note is there but much less, probably because my beer only hit about 7.5% to the real beer's 10.5%. 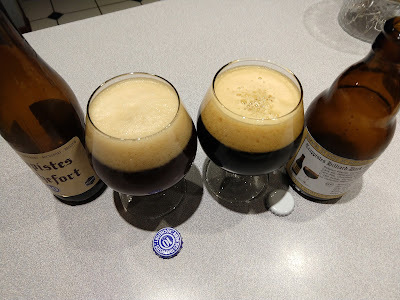 As it warmed, the real Rochefort became more bitter, showed less dark fruit, and a bit more of the burnt/roasted element than it did when it was colder. I love the real beer, and my proverbial hat is off to the Trappists who make it. If I take my beer as just "a random Belgian Strong Dark Ale" then it's actually quite good. Others I know who are Belgian dark ale fans have enjoyed it. So in that sense, it is a good beer and I am not disappointed with it. However, in as much as I intended to clone Trappistes Rochefort 10, this beer is a near-complete failure. I nailed the foam and the mouthfeel, but lost out on the aroma and flavor. Is the dark fruit being drowned out? If you put three drops of lemon juice in a glass of Bud Light and three drops in an Oatmeal Stout, I suspect it would seem like there is "more" lemon flavor in the Bud Light. That's not because you actually put more lemon in it, but because there is so much more malt flavor in the stout that it drowns out the lemon juice. Perhaps that is what's happening with my clone attempts. I've been trying to hit both the gravity of the original beer and the dark fruit flavor by increasing the amounts of dark sugar and Special B. That's also making the beer too dark and perhaps hiding some of the flavor that's there. Would it work to make a lighter beer, put in enough Special B and candi syrup to hit the color, and make up the gravity with rice syrup, corn sugar, or some other neutral fermentable that produces the alcohol without adding to the color or making the beer heavier? This approach would be more like the "three drops of lemon in a Bud Light" idea, where what I've been doing is more like trying to add more and more lemon to the stout. The above recipe would end up making a mahogany colored ale that's 24 SRM and 10.5% ABV. The real Rochefort 10 is reportedly 24 SRM and 11.3% ABV. That's pretty close. On the other hand, the above recipe would be about 32% adjuncts. Even by the Belgian standards I have read about, that seems high. Maybe include some rice syrup or some additional pilsner malt? I don't know. In any case, I've got work to do if I actually want a passable clone of Rochefort 10. Malt dominant with nice dark fruit esters - a touch of roast. Lots of raisin. Very dark, nearly opaque. Should be a bit lighter. Head dissipates evenly. Acidic but nice malt character. Dark fruits. Plum. Sweet, chocolate, and roast. Malt-forward with some fruit. A bit sweet, but good for style. Could use more fruity yeast esters. A touch of Belgian chocolate. Excellent overall! Good grain/caramel/dark fruit. Good balance and finish. Very nice beer. Belgian yeast is so subtle as to allow this to maybe overlap with Old Ale, and that's fine with me. KEEP IT UP! Nice balance. Could use a bit more body and lighter on color (not too much). Looking for a more dark red. If you look at my earlier notes, I felt the color was too dark. The judges basically agreed. I didn't overcarbonate this one, as it was brewed in The Grainfather where I had volume and gravity fairly well dialed in. I need to learn how to coax more flavor out of the Belgian yeast. A Ferulic Acid Rest can help with that, and I didn't know about that at the time I brewed this. I'll try that next time. Some time ago, perhaps more than a year back, I purchased a Great Pumpkin Ale kit from Adventures in Homebrewing. The kit's been sitting in my basement in the original double-bagged container ever since. This weekend, I decided to brew it, though I held out little hope that it will taste very good - not because I think Adventures in Homebrew didn't make a good recipe, but because it has to be at least a year old. There's a good chance the grain has oxidized and gone bad. But rather than throw it out, I decided to brew it anyway. The worst case scenario is that I'll have to dump it later. The original recipe made for a very weak beer compared to most pumpkin ales I've had. It was estimated to have an ABV of 4.3%. I'm not sure I've ever seen a pumpkin beer that low. I was also concerned that given the age of the grain it might not yield much sugar. I decided to put my own spin on the recipe. If it turns out to be terrible, it won't be Adventures in Homebrewing's fault. Since I modified it significantly I decided to change the name to The Grand Pumpkin (a reference to one of the Simpsons Halloween episodes). Below is the modified recipe as brewed. I set the Brewhouse Efficiency low for this batch due to the age of the grains and the likelihood that the yield would be low. Plus, The Grainfather seems to drop in efficiency as the grain bill gets closer to the device's limit of 20 pounds. 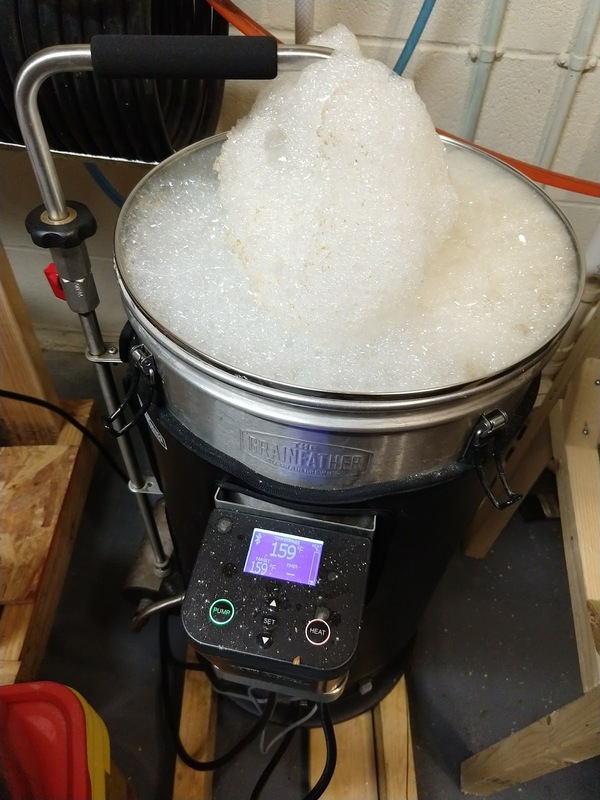 6 gallons of mash water were placed in The Grainfather. Mash water was heated to 158F and the grains stirred into it a few scoopfuls at a time until it was all added. Some additional stirring ensured that it was all wet and that there were no apparent dry spots or dough balls in it. The top of the grain basket was put on and The Grainfather pump turned on to recirculate the wort. After 60 minutes of mashing, an iodine test confirmed conversion. The kit actually called for mashing at 152F. I chose to mash at 158F because I wanted a more full-bodied beer with, hopefully, some residual unfermentable sugars to go with the spice and balance out the hops. At about 30 minutes into the mash, I added a 15 ounce can of pumpkin puree to the top of The Grainfather's grain basket. It slipped my mind to do the mash out. I pulled out the grain basket and poured in the sparge water (1.25 gallons) before realizing I hadn't heated the wort to 168F first. This was past the point of no return, so I let it go. 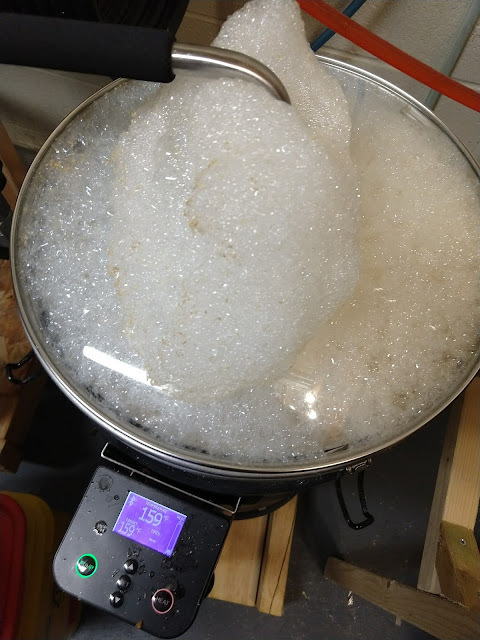 Pre-boil volume was expected to be 6.4 gallons, but was about 22 liters or 5.8 gallons. Gravity was below what I expected, but I ended up adding water to get it to approximately 6.4 gallons, as it heated to a boil. 0 minutes: Turn off heat, turn off pump, and run cold water through chiller to bring its temperature back down before pumping into fermenter. Post-boil volume was a touch under 6 gallons. Wort was pumped through the counter-flow chiller into the fermenter. Wort temperature was 72F. I pitched the dry yeast directly into the beer along with the White Labs Clarity Ferm (intended to reduce gluten so a gluten-sensitive friend could enjoy the beer). I configured the temperature control system to keep the beer between 68F and 72F. The beer is expected to ferment for at least one week in the temperature control system. After that, I'll let it ferment at ambient temperature for another week as secondary, possibly adding the rest of the container of pumpkin pie spice - if a taste test doesn't show enough of a spice flavor or aroma. After at least two weeks of fermentation, I'll dose the beer with gelatin and cold-crash it in the mini fridge for 3-4 days to brighten up before bottling. Why did you let this kit sit around so long before brewing it? I bought the kit on sale along with a bunch of other grain and hops. I kind of forgot about it for a while, because I had so much other grain in the brewing area that it kind of got lost in the shuffle. When I finally noticed it was there, I didn't hold out much hope for it tasting good, so I was hesitant to brew it. I finally reached the conclusion that it was never going to get younger so I ought to just brew the darned thing. Why did you modify the kit? The original specifications called for the beer to be only 4.3% ABV. I've never seen a pumpkin beer that low, and none of the ones I like is that low. Plus, knowing the age of the ingredients, I was pretty sure the 4.3% wouldn't be achieved and I'd end up with a really weak beer. I decided to add some 2-row Brewer's Malt to raise the gravity. Then I decided to add some Honey Malt to maybe sweeten it a bit. I added Cara-Pils and Melanoidin to help give it a nice whipped-cream-like head (which seemed appropriate on a pumpkin beer). I added D-45 because I had some sitting around, and Turbinado because I'd seen another brewer add it to a pumpkin beer and it sounded good. This also helped me get to the gravity I wanted to reach. Did anything go wrong during the brew? Yes. Something usually does. In this case, I'd had BeerSmith set to 80% brewhouse efficiency, which I get for most beers. After the mash, the efficiency was clearly much lower, so I adjusted accordingly. That's reflected in the numbers given above. I also had some trouble with my motorized mill. Its spider gear came apart and I had to spend a while reassembling and tightening it. It needed an Allen wrench, which I didn't have handy and needed to search for. Apart from those things, it turned out well. If I had all this to do over, I'd have made the kit much sooner after I purchased it. In that case, I probably would not have modified it, since I'd have wanted to see how Adventures in Homebrewing's kit would turn out as-is. 11/12/2017: It appears that fermentation has dramatically slowed or stopped on this one. A refractometer reading showed it at 10.2 Brix, which is a bit lower than the gravity I expected. I view this as a further indication that fermentation is finished. I'm planning to dose it with gelatin and a bit of fresh spice later today. Early samples taken from the fermenter have gotten my wife's seal of approval. In fact, she asked me not to give away too much of it, she likes it so much. High praise. 11/15/2017: I added gelatin finings and enough pumpkin pie space shaken into the fermenter to create a thin layer across the wort (maybe a quarter of a teaspoon or so), then moved the whole thing into the mini-fridge to cold crash. 11/20/2017: The beer is looking pretty clear and has a nice aroma, so I decided to bottle it. Yield was approximately 12 bomber (22-ounce) bottles and 30 bottles at 12 ounces. 11/21/2017: I designed and printed the label, then removed bottles from my "hot box" long enough to get the labels on. They'll now sit in the 76F box until they carbonate, which should take 1-2 weeks. 12/04/2017: The first couple of test bottles have been refrigerated and opened. The beer is incredibly dark for a pumpkin ale, probably due to the age of the grain. It has a pleasant spicy aroma, not too much or too little for my taste. The flavor is very close to my ideal pumpkin beer. It's slightly sweet, with a clear (but not too intense) spice note, with a touch of pumpkin flavor, and enough hops to balance it but not enough to make it bitter. I get a cola-like flavor from it, possibly due to oxidation, but it's hard to say. Overall it's a good beer and I'd make it again with fresh ingredients. Mash at 156F instead of 158F to reduce the sweetness slightly. I think those changes would get me closer to my ideal pumpkin ale. 12/22/2017: The beer has changed quite a bit since originally bottled. The spice aroma and flavor seem to have decreased quite a bit, and the beer itself has gotten quite a bit darker. It's interesting to note that it seems very little like a pumpkin beer now and more like a brown ale.